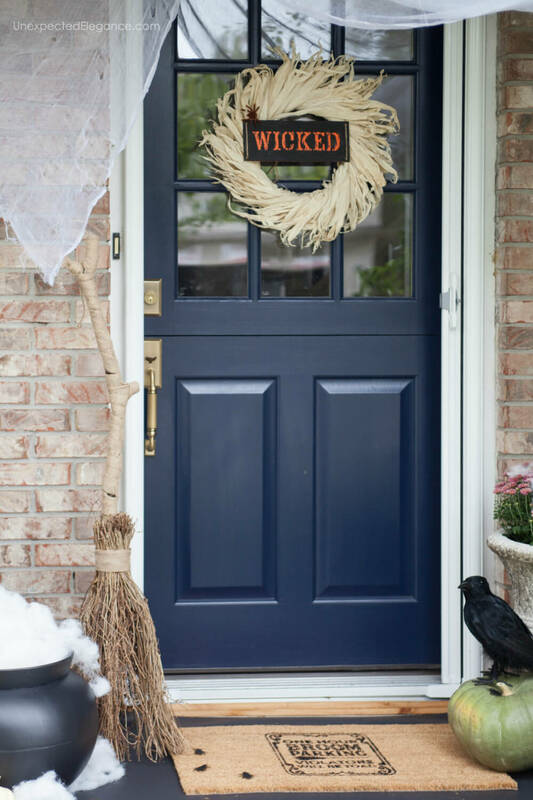 Check out my WICKED themed Halloween porch! 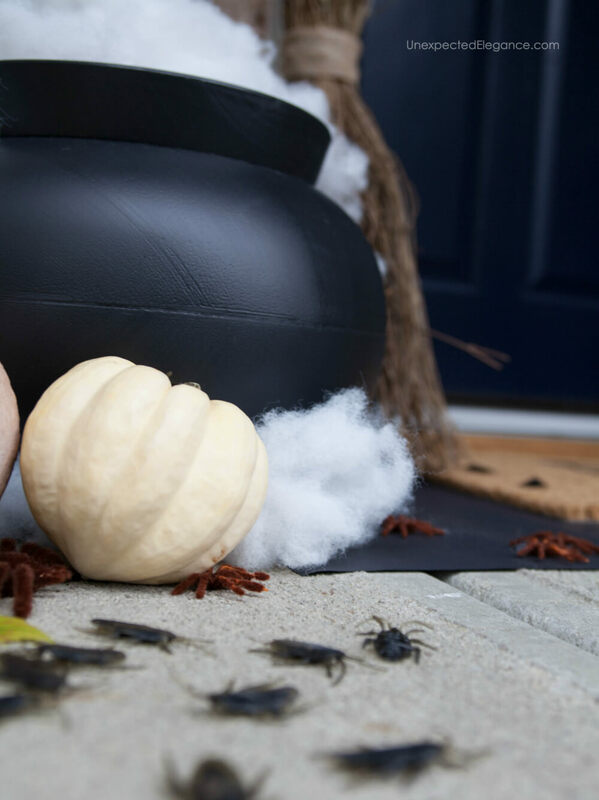 Also get the tutorial for the cute doormat and “smokey” cauldron. 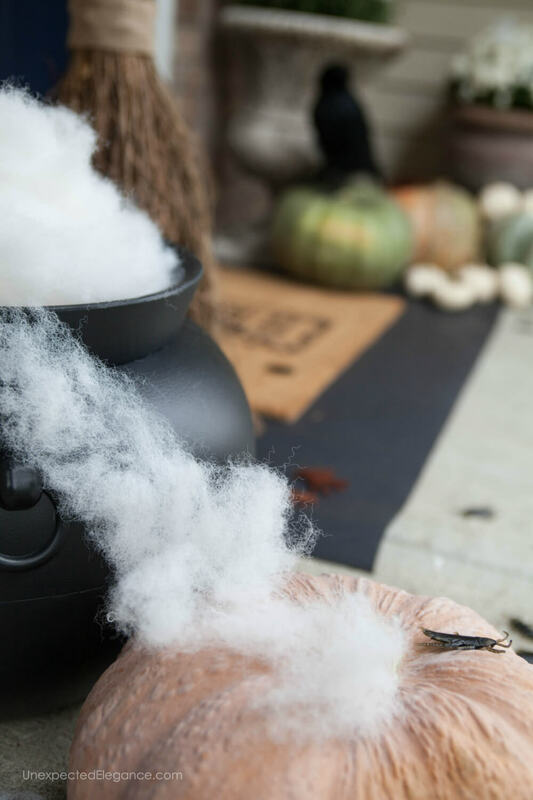 What do witches ask for at hotels?…broom service! Who here loves Halloween? I wouldn’t say that I fall into the “love” category, but it’s never stopped from having fun with the holiday. 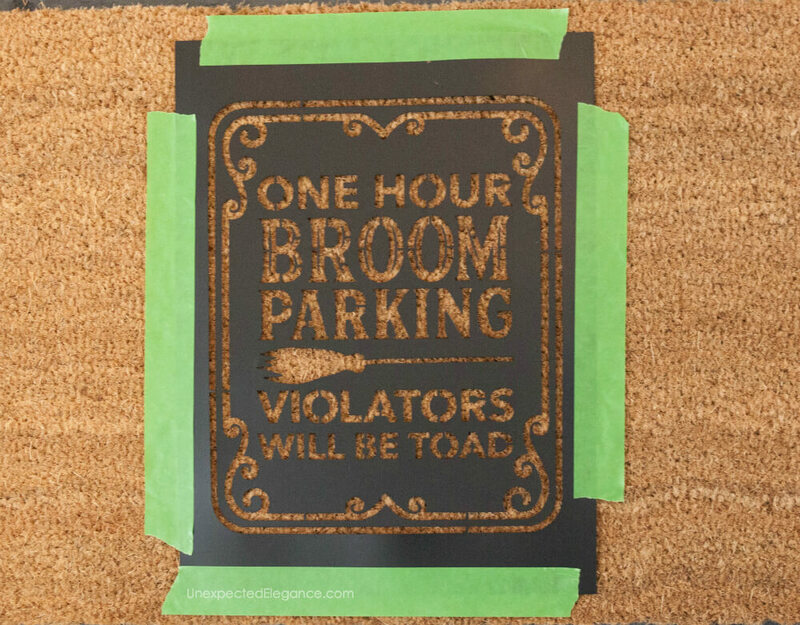 I started by making the “One Hour Broom Parking” doormat. 1. Tape the stencil down onto the mat. 2. 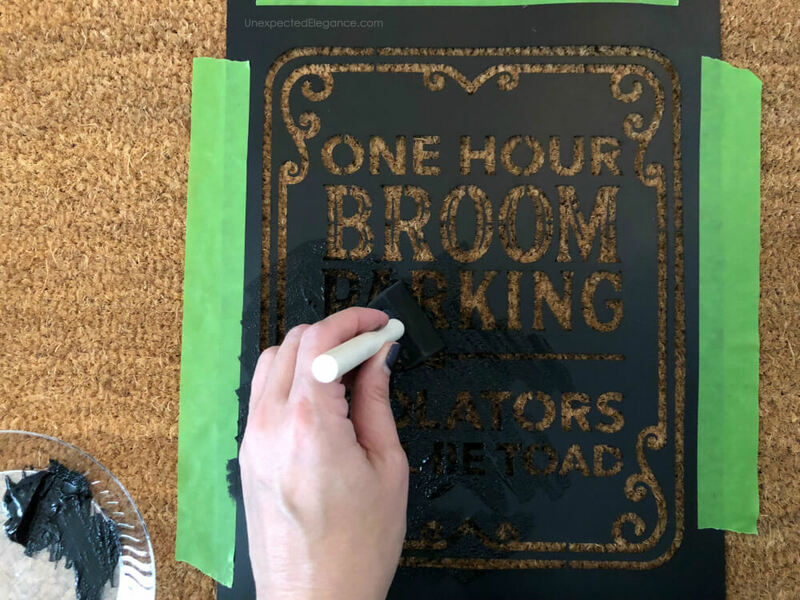 Use a sponge brush to fill in the stencil. Be careful and dab the paint to create the design. Don’t wipe or the paint will get under the stencil and spear. 3. Pull-up the stencil carefully. You can start on one side and make sure that you have good coverage. If some areas need more paint, add it before removing the stencil. I’m not really into the “gory” decor, so this was a fun take on Halloween! 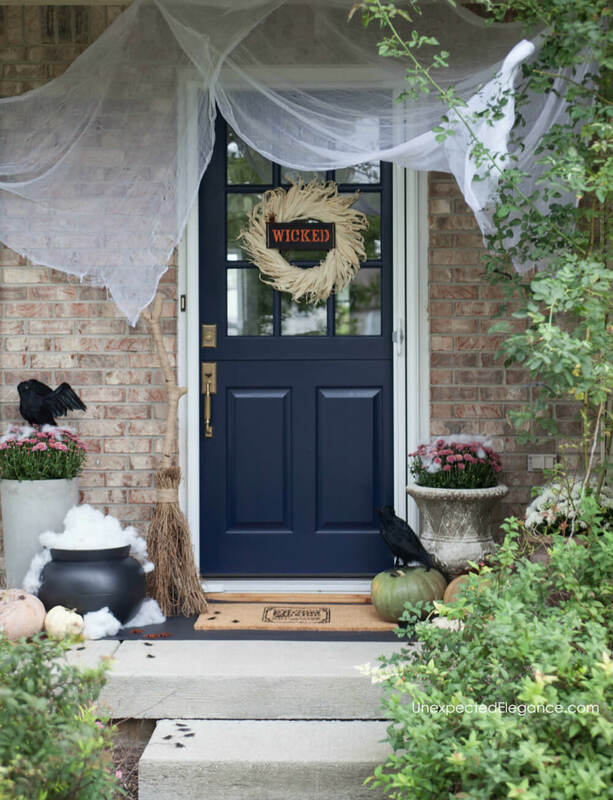 All of the supplies came from JOANN if you’d like to recreate this Wicked themed Halloween porch. 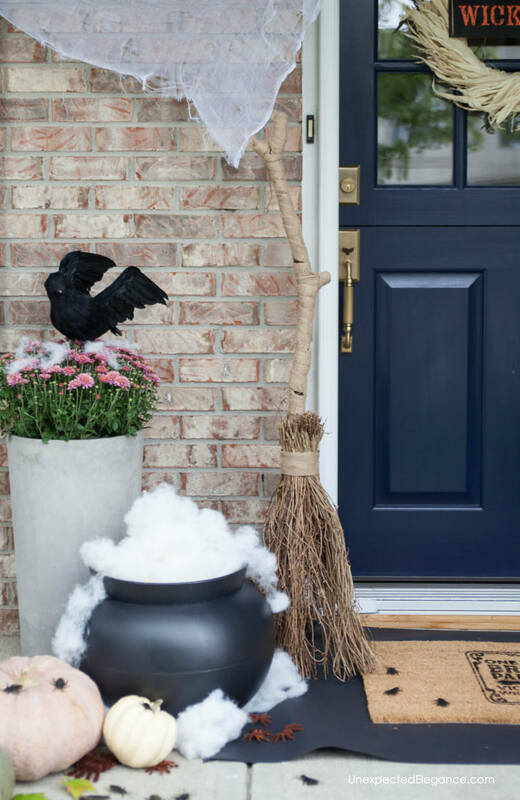 The broom has a built-in stand, so the wind doesn’t blow it over and the large black crows look so lifelike! The rubber cockroaches are a great filler! They are creepily, realistic.  I literally just sprinkled them all over the porch and on top of the pumpkins. I used a polyester fiber stuffing I found in the sewing section for the smoke. It worked perfectly! I just piled it on top of the cauldron and then pulled it down over the sides. The effect created a feel of real smoke. To finish it off, I added a few tufts around the bottom. I think the cauldron might be my favorite part of the porch. You can’t see it in the pictures, but I also added some LED string lights inside the “smoke”. When I turn them on at night, it looks like a potion is brewing. 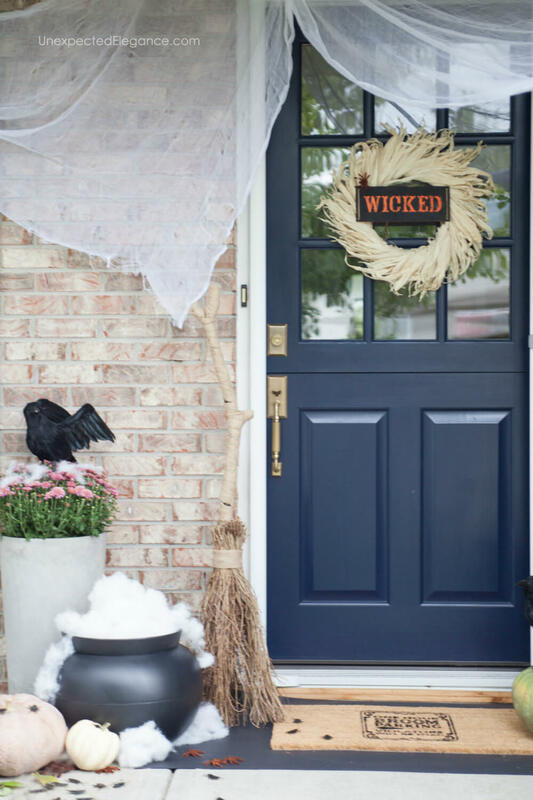 I used a corn husk wreath because it is a light color and stands out against my dark blue door. 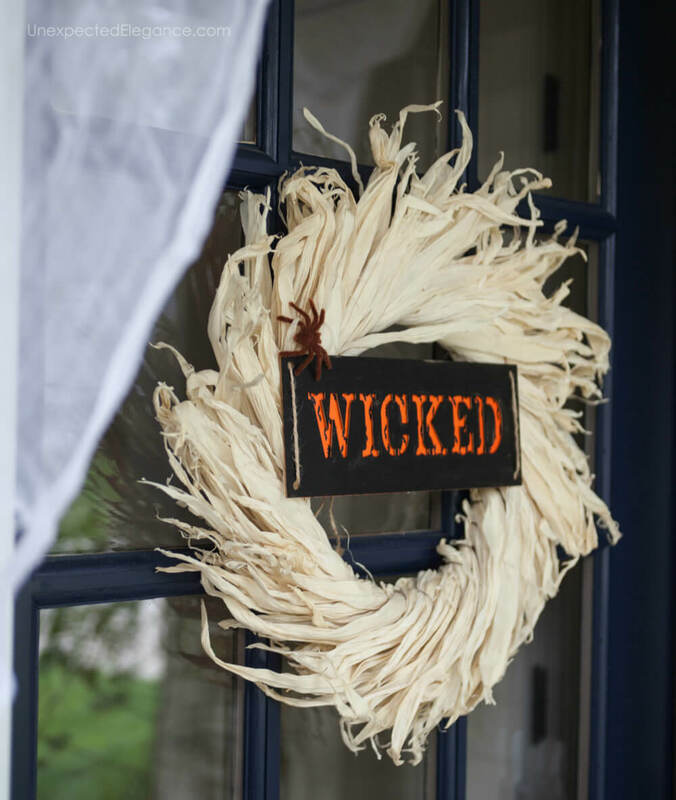 The “WICKED” sign is from the craft section. A little black paint, leftover from the doormat, sting, and a fuzzy spider finished it off. Final, to add some drama, I added the white cheese cloth by hanging it from a few nails and draping it over the rose bush. 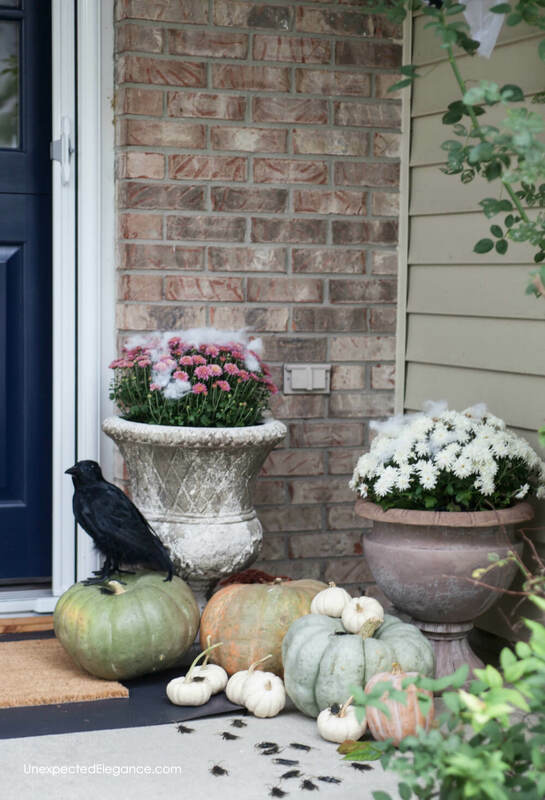 I love how it turned out and this decor is easily added to my existing fall porch for a quick switch to Halloween. Love our door and how you made the sign! Thanks for the tutorial! Okay, those cockroaches really take things to the next level. EWWWWW!!! Great decor, now all you need is a black vodka cocktail~!! I’m going to JoAnn’s tomorrow! 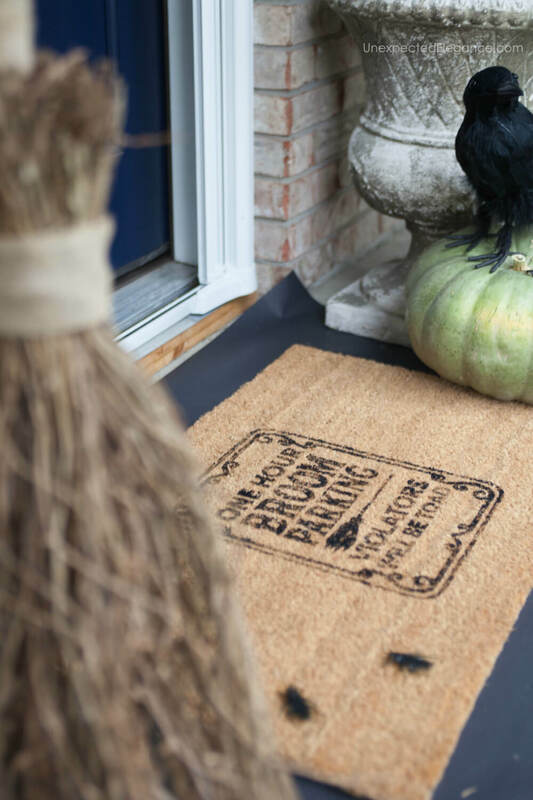 The door mat is such an amazing idea. Thank you! AND Congratulations! Check your inbox for an email from me. Love the boiling cauldron! Will have to add that to my own front porch Halloween decor. Thanks. 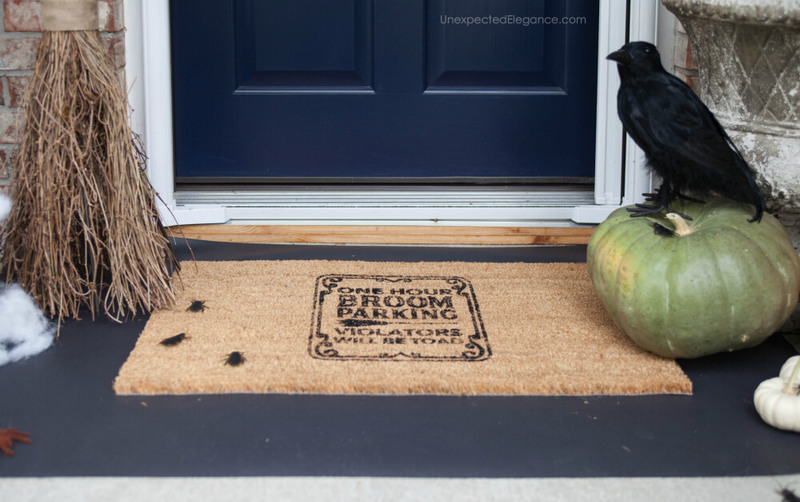 I like the doormat idea. Love the cauldron idea! Thanks for sharing your ideas! 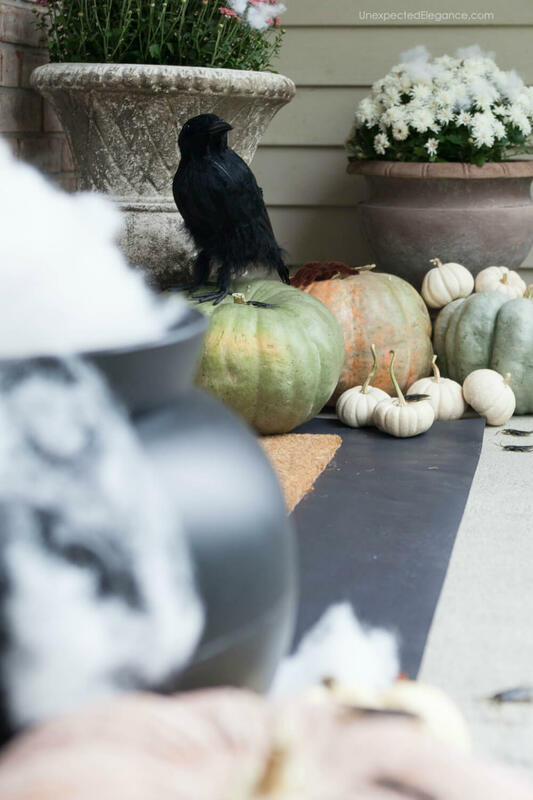 I love this Halloween porch decor so much! 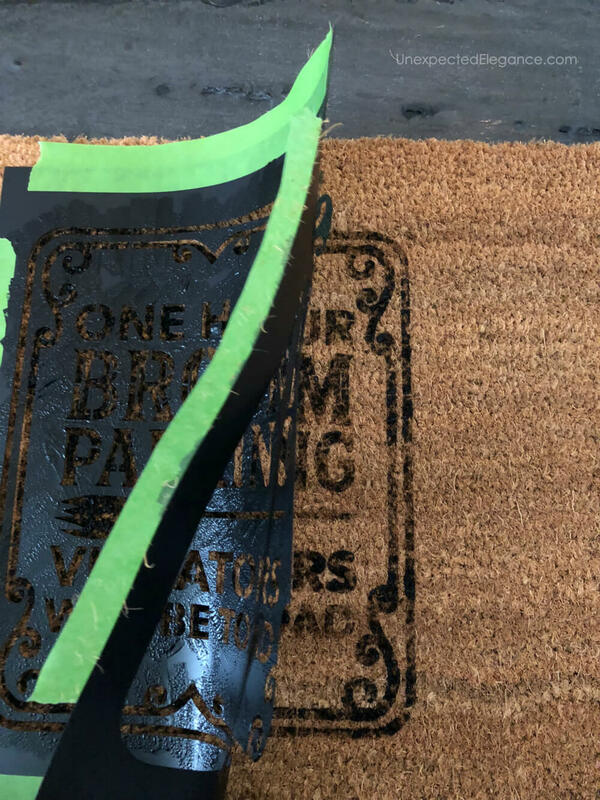 I didn’t even know Joanne’s carried stencils like this. I love the broomstick and the black crows. Your light up cauldron sounds so wonderfully witchy! 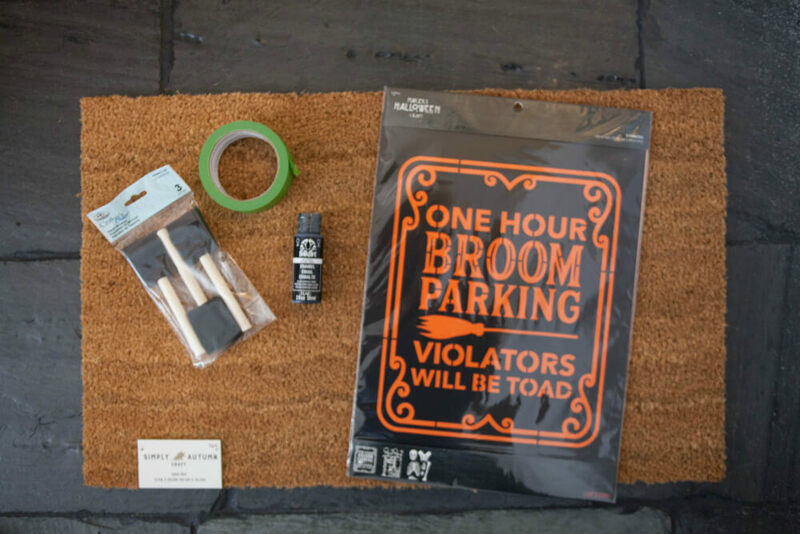 I bet the Trick-R-Treaters will love your house on Halloween! Love the cauldron! It really looks like smoke! The doormat is cute, too! Thanks for the great ideas! What color is your front door? I love your porch. Simple & easy.